The latest iconoclastic investigation by VAN magazine contains much that is discussed openly among musicians but has never before found its way into print. In musical circles, Barenboim’s temper is legendary. He has thrown fits because a violist rolled his eyes, because a singer bowed in the wrong place, because a favored principal player was on vacation. He once berated a musician who lacked concentration because someone in their immediate family had died. He has insulted a doctor who said that a performer with a stomach flu was too sick to play. On at least two occasions, he has allegedly grabbed and shaken members of his staff in anger. “I always say it’s a climate of fear,” said a current employee at the Staatsoper. Barenboim was raised at a time when being authoritarian was practically in the job description for a conductor. At the beginning of his tenure, the concentration of power in his hands was productive, allowing him to effectively reshape the large institution. Now, Barenboim is always on the minds of his staff, whether he’s actually in the house or not. “You can always feel when he’s here, because everyone is tense all of a sudden,” said a player in the Staatskapelle orchestra academy. When he’s away, the orchestra is less on edge, “as if it needed to take a few deep breaths and relax.” As several sources told VAN independently, Barenboim expects staff to visit his green room and praise him after performances. Those who don’t risk falling out of favor. The article is by Jeffrey Arlo Brown and Hartmut Welscher. Then at the end there was this infallible and odious patron of the Teatro Municipal who always wanted to cheer and applaud before everyone else and always insisted on very explicit and showy terms to have some extra numbers. He’s known among Rio concert goers as “Maravilha” or “Sublime” (Mr Wonderful or Mr Sublime), for the words he invariably ejects in that magic moment when the music has not yet died away completely and the rest of us have not yet come back from wonderment. That’s exactly the moment this individual wants to hear his own voice. (I must admit to his good taste: it’s one of the best moments ever!). Music and arts reflect society (or at least should perhaps?) and so-much has changed in the last generation. Deference, authority, class structure have all ebbed away, or at least morphed. Barenboim is a first rate musician – no doubt, beyond debate, but I recall less and less music making that is memorable or really tasteful in the last 15 years. He seems to do everything, (musically) but nothing uniquely – rather like a sort of very high-class Gergiev. Thinking of another unpleasant man (a well known English baroque specialist) I simply ask this – what will remain that is pleasurable or useful to the world when they have shuffled off this mortal coil? The answer is 1) Recordings 2) Writings, 3) Teaching. And when they have all evaporated like water on a sunny pavement, no-one will even care about their self involved insecurity. The world moves-on and they are terrified they might miss the last bus. Pity them, don’t venerate them. I’m sorry, but regarding Gardiner, I think you’re completely wrong. There are countless recordings of absolutely genuine interpretations (St. John’s Passion, Brahms Requiem! !, Mendelssohn Symphonies), that are and will be influencing musicians and especially conductors around the world. Thats precisely what I said. What lasts is recordings and the tradition. I.e. manifest by example and teaching. We agree! The liar, cheat, adulterer, thief and braggard are just dissolved. Whether that is just or even desirable is for history to judge. I didn’t know that connubial fidelity is important for a musician. And I didn’t know it’s judged in a debate about his professional behavior. It’s kind of galling for the people who have been hurt and humiliated by a ‘great man’s’ bad behaviour – whether he’s needlessly bullying them in rehearsal, or by cheating on them in a marriage – to see the ‘great man’ venerated by those who don’t realise (or believe) the pain he’s caused. Or, critics and members of the public then excusing crimes and abuse because of the ‘great man’s’ genius. This happened when Robert King emerged from prison – and some people complained that his prison sentence had deprived them of enjoyable concert experiences. Never mind the young children he scarred…. A fellow I know has a daughter who sang with JEG’s ensemble and he recounted recently how rude he had been to her in front of absolutely everybody. You’ve got to be tough to withstand this, but she simply went out a fixed what he said was wrong and was returned some time later for another gig. Some melt like snowflakes, the others develop chops and say, “yeah, it’s tough out there but I’m in it for keeps and willing to take the, er, advice”. There are certain ideologues who want every little seam and crease of unpleasantness removed, especially for them. Gardiner is an absolute bully to his musicians. At least Baremboim is a genius, not a charlatan. But both men are appalling to work with. I know. Barenboim’s musical “greatness” is highly debatable. The only thing that might not be debatable is his memory. But this has nothing to do with musical greatness. His aims and character are not debatable unfortunately. He is a pathetic, ill-mannered individual with disrespect to all, colleagues and public alike. Furtwängler may have been Barenboim’s idol but apparently not his role model. I’ve never heard that he behaved such a way, other flaws not withstanding. It’s precisely this kind of arrogance and hubris which causes him to lecture an entire nation on what it should do about its neighbours. These staggeringly hypocritical virtue-signallers think we’re not onto them!! I disliked him years ago, when Jacqui was terribly ill.
It’s ‘Jackie’, not ‘Jacqui’, SSF. The least you can do is get THAT right. Tommy Beecham was legendary for rebuking audiences collectively and even individually (“Shut up, you!”) and usually entirely justifiably. I don’t blame Barenboim a bit for expressing contempt for such oafs as you described. Neither do I! I am actually really glad that he gave this idiot what he deserved. As a civilized Brazilian who just cannot stand the behaviour of most of our concertgoers (including the supposedly elegant and cultured ones! ), I feel revenged! Yes, but Tommy Beecham did it with some charm and a twinkle in his eye. The sheep, united, don’t need the dog anymore. What was that thing a few years ago at London Proms where Ring was done. During applause he was seen shouting at the concert master and jabbing his fingers in a nasty way – then storming petulantly off. Anybody know more ? Yes. But it stays unsaid in public. And, like other vain, violent, and intolerant men, he is intent on resolving the conflict between the Israelis and the Palestinians by virtue of his… peacefulness and patience? It’s called hypocrisy. Still, it’s a jolly good thing he’s trying to do something about the Israel/Palestinian conflict, isn’t it? And if it is hypocrisy, do you think he should give up his work over the Israel/Palestinian conflict so as to remove himself from your charge? And is he really guilty of hypocrisy? Or is it merely not carrying over his good principles into all the arenas of his life? You’d have to be intelligent enough to understand that, of course, and most on the Left don’t ever get it. Sadly for us all. He has no intent of solving anything. His aim is SELF PROMOTION at any cost, even at the cost of Jewish lives lost. Connecting with antisemites serves no peace purpose. Barenboim is always for himself ONLY. No, It’s called complexity. People are awash with apparent contradictions. Barenboim obviously suffers from a narcissistic personality disorder. My suspicion is that his small body size is troubling him. I am perpetually surprised at the number of posters with psychiatric expertise and their eagerness to diagnose psychiatric disorders from a few scraps of online news. How many chapters of that little book on How To Be A Spiffing Psychiatrist have you read already? Seriously, it’s more the norm than the exception in the classical music biz. Or look at it that way: who would torture himself all his youth mastering a task of highest difficulty, to then go out on stage and play your heart out in front of hundreds of strangers? Very well said, Paul. What also surprises me is the number of people, e.g., Cohiba and Anon, who claim to have worked under/with Barenboim. With such screen names, one can only wonder, especially given that DB is an anathema to certain relentless commenters on this site. If am being charitable, I think he has suffered greatly from the loss of his wife and musical partner, Jacqueline du Pré. That, and too much success and flattery too soon, would make anyone slightly unhinged. I don’t think you can blame his personality on reactions to the death of du Pre, especially given that for many years of her 15 year battle with MS it was a marriage in name only. 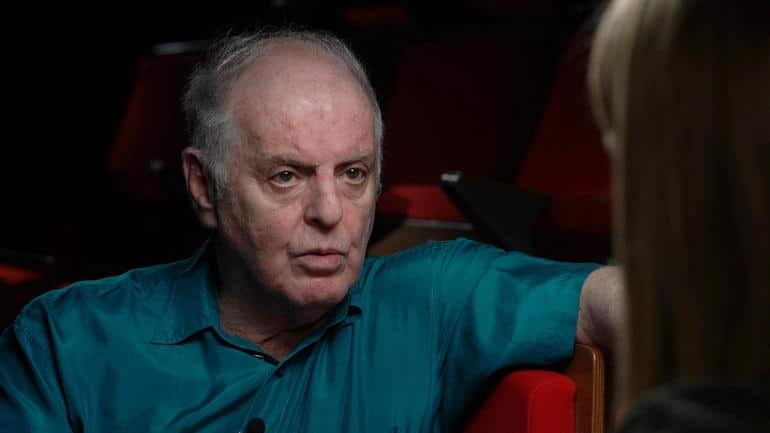 Barenboim had been in a long-term relationship with another women, and had kids with her many years before du Pre died, and though he refused to legally divorce du Pre, he married the other woman not long after du Pre’s death. Doesn’t sound like a distraught and suffering widower to me. I think his private life shouldn’t be discussed here. Given that he started a long-term affair and had two children while Du Pré was still alive (he had the great generosity of spirit to hide it from her, apparently), I think we can skip the distraught-husband-ever-grieving-the-loss-of-the-love-of-his-life posturing. Falling in love with someone doesn’t mean you stop loving (or at least liking) your former partner. I’m divorced and newly married, but nevertheless I care a great deal for my first husband and I’ll certainly grieve when he dies (he’s 25 years my senior, so I suppose he’ll die before me). We saw examples of the maestro’s temper at Bayreuth rehearsals. They would come without warning and blood pressure would raise. I am so pleased this story is coming out. ==On at least two occasions, he has allegedly grabbed and shaken members of his staff in anger. Haha – he’s a tiny little man. One day somebody will fight back. Thanks so much for posting this – it’s very thought provoking. I predict there will be a lot of replies to this thread. Since Kleiber is dead, he should take a tip from Haitink instead. Perhaps you missed the real intention behind the comment!! BTW, always enjoyable reading thoughts on SD – whether I agree with them or not. How can you separate Kleiber’s slowing down from cancelling at the drop of a hat? Cigars were too strong. Too much steak and sauces. Nearly all great conductors have shared this stern disposition. When an instrumentalist rolls their eyes in sarcasm or the musicians aren’t focused (something necessary and expected, purely professionally) the music will suffer, without a doubt. A conductor’s job must include “whipping the votes!” Dissent in the concert hall is destructive. Maestro Barenboim is not malicious. He is akin to Maestro Claudio Arrau in the sense that “he is uncompromising and most serious as an artist.” I myself become furious with loud and obnoxious audience goers, as this is ludicrous and the music deserves much more reverence than that – “silence in between the notes,” let’s not forget. Image clapping in between movements of Mozart’s Concerto 23, or Brahms’ Symphony 1. Ridiculous. I understand why a stern Maestro is often necessary to preserve the integrity of the music. The greats prove this. They do that by choice. I have been a professional chorister for a long time, and have sung under many talented, eminent directors. One chorus in which I sang had, in its fourth decade, gotten rather sloppy. A new artistic director (the ensemble’s 2nd in 43 years!) brought immediate discipline to the ensemble; he raised the artistic standard, exacted personal and professional responsibility, and did not tolerate anything but excellence. Every last singer adored this person, because he did all this with grace, professionalism, and respect for every musician. Not one single person resigned from the ensemble, and every single musician chose to re-audition when the time came. There was abundant respect flowing in each direction. This director devoted himself to the music and, though he had a healthy and normal ego (necessary in a good leader), he never let it take control and never, ever, let anything become personal. My point is that it is possible to be demanding and expect the utmost from the ensemble without being a godawful jerk. Barenboim is undoubtedly a gifted musician and has given memorable performances and made memorable recordings, but it is curious that he is so demanding of others but not always of himself. He’s well known for spreading himself too thin and giving unprepared performances. When I have heard him in concert as a solo pianist he has clearly been unprepared (virtually sight reading in some cases). His pursuit of excellence in orchestral performance is admirable, but, since he frequently falls short of this goal as a soloist, I would expect him to pursue his aims with a little more humility and grace. A known cantankerous old man is revealed to be…. a cantankerous old man. Color me shocked! Can’t help but feel that this is a cheap “me too” type grab at someone whose worst sin seems to be posessing a stereotypically perfectionist disposition with the temperament that goes along with that kind of thing. You might not say that if you were at the receiving end of that sort of cantankery. Musicians and staff get very tired of the tantrums of the ‘gifted’. Quite right. The idea that a conductor must have explosions of temper and temperament to achieve anything is a notion that does few people in the orchestra any good. OK, if you do something wrong, make a tiny mistake, then with some conductors you can expect a rebuke. But when a conductor develops a personal vendetta (and it does happen) against a musician, the atmosphere is horrible. It’s not necessary. It appears from the original article that Barenboim derives his power from his ability to snap his fingers at the German federal government and gets € hundreds of millions, even as thousands of homeless subsist on the streets of Berlin and €millions are squandered on illegal migrants. What political influence does he wield, which card does he play? Being “a personal friend of Angel Merkel” would in any case make him effectively part of the current leftist-collectivist government cartel. Merkel is a member of the Christian Democrats. The party is on the right and believes in a Christian ideology (hence the name). Neither socialist nor atheist. I have played for him on several occasions and have not experienced anything but a desire for making great music and setting a very high standard. Not sure if his temper is any different or worse than others like Muti, Toscanini, or Szell. As someone else has commented, Barenboim was hatched in the last era of the Tyrants but his experiences in London esp with the English Chamber Orchestra softened him. His behavior with staff may be different than with his musicians. Laughable comment. Really, what would he care about this article? He is King of the Hill and appears to answer to no one. Well, if Barenboim isn’t as “hot tempered” as Reiner and Solti were, maybe he is liked by Chicago musicians. Solti was never “hot tempered” in Chicago. At Covent Garden, on the other hand, he had to work with musicians who had come out of cinema orchestras or brass bands – and he was younger and less tolerant. Solti built the ROH into one of the top opera houses. And the musicians in the pit mostly liked him, recognizing how he improved their playing. It’s no secret, Muti has had his temper in the past but never with allegations of physicality, or sexual impropriety with chorus members (or even the members of chorus members as it were…! )….BUT he always has his own aesthetic and the learning to illuminate it. All the singers I know who worked for him, (very hard) in serious Salzburg roles etc, worshipped him and his teaching. His Verdi and Mozart are totally indisputably his and uniquely so. I can tell he’s conducting when I switch on the radio. Though not perfect – of course, he’s a great guy – great musician. The real deal. A very different personality and world-view from Barenboim. Fully agree. Muti’s temper was definitely more of a problem in his younger years, but he has mellowed out quite a bit and today, is quite personable (and humorous) with staff, musicians, and fans. Nothing compared with Barenboim. It’s now a hazy memory, but I recall that at his first-ever appearance as a conductor in New York, in about 1970, he walked off the stage shortly after his first entrance because the audience had not completely settled into their seats. I don’t remember what was on the program, but Ashkanazy was the soloist, and I think the orchestra was the Philharmonia. He returned several minutes later. It seemed a rather audacious act from a man who was still in his twenties at the time – conductors of such a tender age were more rare at that time than now. Barenboim is an enormously talented man who has never completely convinced me as a conductor. In his younger years he used to talk about emulating Furtwangler, but it seemed that he was applying a set of techniques and mannerisms from the outside that he didn’t actually feel. More recently, performances sound ill-prepared and under-rehearsed. Given his enormous talent, it is probably easy for him to deliver a satisfactory, though rarely great, result, with minimal effort. And his full schedule is no help here. This is what I sensed, as did another commenter, at his Ma Vlast in Chicago in November. Coming just two days after Haitink’s last Chicago appearance, the contrast seemed even greater. I have heard Barenboim live several times – conducting from the podium or the piano, playing the piano. To my ears his performances can be anything from mediocre to truly memorable. No doubt he can notice that , if he is honest with himself. Shouldn’t he therefore be more tolerant of other people’s off moments? I’ve listened to a lot of his Beethoven Piano Sonatas and, honestly, they’ve NEVER moved me. I’m unsure why. He was nasty to a cellist in his Divan orch (in front of everybody) for taking too many sips of water during rehearsals on a very hot day. ‘hearsay and scuttlebutt’ – would you describe your own experiences and opinions with these words? Or just other people’s? So, you’re saying he’s a horrible person with no empathy and lacking any good judgement. But when he mouths the right platitudes and slogans when it comes to “migrants” and so-called “Palestinians” we fawn all over him and hail him as a brave genius. Now do you see why Michael Savage always says “liberalism is a mental disorder”? I completely agree; it’s the 21st century pathology. Each time I hear their naive gushings I actually feel sorry for them – and sorrier for the rest of us -grounded, practical and realistic people who understand what life is really like. So, you’re saying Trump’s a horrible person with no empathy and lacking good judgement. But when he mouths the right platitudes and slogans when it comes to “building a wall” and “making America great again”, we fawn all over him and hail him as a brave genius. Now do you see why liberalism, conservative-ism, libertarian-ism, communism, any “ism” of your choice, could be a mental disorder. So can no ‘isms’. No, I don’t fawn all over Trump and hail him as a brave genius. I think of him as an amateur and a crook, and totally unworthy of his oath of office. You are right. But we all have our flaws and soft spots. In my experience he’s not actually very good. I’ve seen DB take a swipe at a page turner and continuing to humiliate him for the rest of the concert. Back in the 1970s before Barenboim had conducted opera, his Svengali Peter Diamand was Director of the Edinburgh Festival. He arranged a series of Mozart operas, a different one every 2 years, to be conducted by Barenboim with the ECO and a variety of mostly stellar soloists. Unfortunately Diamand selected poor directors and neither Giovanni (1973/4) nor Figaro (1975/6) were a success, although the subsequent recordings had their merits. What was unavoidable for everyone who attended was the actual presence of Barenboim. The small King’s Theatre had no orchestra pit and so the orchestra was at stalls level. It is perfectly usual for a discreet narrow focus spotlight to be on an opera conductor so he is clearly seen by the cast. Barenboim had two very bright spotlights so their beams were very clearly seen criss-crossing the auditorium, even during the dark scenes where they all but killed the atmosphere. It was clear he was supposed to be the star of the evenings. In one way it was fortunate that the cycle was thereafter discontinued, for Diamand then persuaded Berganza to make her debut as Carmen in a Faggioni/Frigerio production with Domingo, Krause, Freni (at the premiere), Abbado and the LSO that was to become legendary and is still available on CD today. Sorry to contradict you, Nick, but the King’s Theatre in Edinburgh does have an orchestra pit which can be adjusted to accommodate a full Wagner Opera or a smaller ‘band’. I can only presume that having the Orchestra at Stalls level was Barenboim’s choice. It would have greatly reduced the seating in the stalls! Apologies if i got that wrong. The orchestra may have been below audience level but I recall Barenboim was pretty much in full view. However, it was all roughly 45 years ago and my memory may not be accurate. What I do remember clearly were the two bright spotlights! Hi Nick. I don’t disbelieve that the conductor had the orchestra at ‘audience’. Having said that, the full Kings pit is quite far down although there’s a complex raised pit that can be employed for smaller band. It may not have been installed 45 years ago so it’s possible Barenboim took the lesser of two evils. HI Robert – merely for accuracy, I am now certain the pit you refer to was created as part of the theatre’s 1985 renovations. These installed the pit lift when, in the process, it was discovered there was an “extended capacity” – presumably under the stage. And for that Carmen opera, with all the star singers and Abbado, the budget had been cancelled bu-y the City of Edinburgh. Peter Diamand informed the singers that it would not happen… ALL of them sent back the contracts and came to sing for FREE. That was their “present” to Peter Diamand! Who in fact had been the person who gave Barenboim his first chances to perform. Like he did with Kathleen Ferrier. With a receptive home in Berlin, no wonder he forswore all American orchestras, I can’t think of a single major American orchestra that would tolerate half of what was reported about his behavior or give him a quarter of the control he exercises at the Staatsoper. On his return to Chicago after a 20 year absence, there were visibly empty seats throughout the hall. The critics and musicians were politely lukewarm, not much more. It is not just the US where he would not have that kind of control, I don’t think he would get that control at any other institution in Europe. Personally, I find the extreme control he exercises at the Berlin Staatsoper baffling. they forgot to write about [redacted] his friends he pushed in certain positions (regardless of the level) .. well – all of those facts are well known, . in the Berlin State Opera there is a time when Barenboim is in the house and then there is a time when he is away ..
Ohh, I miss Claudio Abbado still so much…………. he was the one that after Karajan’s era said to the Berlin musicians: “I’m not Maestro, I’m not Mr Abbado, I’m not Your Majesty, please call me just Claudio”. Another planet. Yes, but, for each orchestra musician who is impressed by that, you find two, who want a more clear and authoritative direction from the podium. Horses for courses. You do a ‘Faustian pact’ with the devil, there is always consequences. Barenboim brought artistic genius, wealth and prosperity to Staatsoper. By his good connections into the political class, the orchestra supplemented their mediocre pay checks to be competitive to the level of the Berlin Phil, by federal state funds, that were given not to the orchestra directly and unconditionally, but given contractually bound to Barenboim’s presence. So you could call the system a state sanctioned tyranny in Berlin Staatsoper. There were always those who also suffered under his personal flaws. People left, people inflicted trauma. But the majority allowed it, in an – unfortunately inhumane yet too humane – manner, that is ALWAYS the empowering element to tyrants and the real drama in such scenarios. The king might not even understand, why the sheep are all of the sudden ganging up and biting his legs. Nobody confronted him ever in the past. Why now? I haven’t done anything particularly bad recently? But god forbids you criticize their authors using their own “arguments”… Mr. Lrebrech don’t want to offend these idiots because he needs them. Hence their regular presence and the absence of any dissenting voices. Sir, you have an anger management problem, for which you were long banned from this site. I m sorry to see that you have not recovered. A lot of people agree with what jaypee said above. I don’t find any evidence of anger. And yes, I’ve been banned from the site too, obviously for saying things you don’t like to hear. Can anyone explain why Barenboim has never conducted at Covent Garden?? He did not like the neighbourhood because of the blasphemous name of the restaurant ‘Brahms & Liszt’ in Russell Street. He doesn’t conduct the London orchestras either. Barenboim wrote interesting books, especially “A Life in Music”, where he extols the core of humanism as embedded in classical music, its power to humanize, to civilize, to educate the emotions, to reach-out to ‘the other’…. etc. But in a TV interview he underlined the ‘historic inevitability of atonality’, and in the text of a London concert programme booklet. Barenboim compares Beethoven and Schoenberg as two similar heroes who created ‘irrevocable consequences for the future of composition’, which would make ‘their absolute value different from other composers’. Etc. etc…. all totalitarian rewriting of history as a line of progress, i.e. modernist ideology. Hence his friendship with Boulez, which – if he meant his descriptions of the humanism of classical music – is like helping the hangman lay the rope around your own neck. These things have been known for years in Berlin‘s musicians circles…..so nothing new…After the wall came down it was a decision of the German politicians to push the Staatsoper up to the top representative opera house in Germany. Barenboim with his reputation and political influence seemed to be the right man. And yes, he achieved a lot, financially and artistically, but the price was and is high. He kicked out half of the musicians, put in his „friends“ ( lots of these weren’t his friends anymore after a couple of years and were kicked/mobbed out also). Since this whole Staatsoper construct is absolutely dependending on DB, there is no one who dares to say anything against him, neither politician nor musicians. As „Tamino“ wrote here earlier: „if you do a Faustian pact with the devil, there is always consequences“. Sad but true. I find the idea that the Berlin Staatsoper is dependent on him to be baffling. Any reasonably competent music director, with a sufficient budget, would have raised it to be the top “German” opera house. Arguably, both Vienna and Munich still rank above Berlin so it isn’t even clear he has been completely successful. And don’t forget both Dresden and… Berlin, the other one (the Deutsche Oper). It’s good to see how all that BS is going out of fashion, at least in the classical music world. Interesting that the man who was considered the dictator pa excellence, Karajan, said that losing your temper in a rehearsal was counter productive as it made the musicians nervous and they didn’t give of their best. Of course, he had many other ways of showing his displeasure. Musicians that worked with him always told me Karajan was rather on the cold side; aloof, but always courteous and with a no-nonsense approach. Yes Barenboim is unquestionably a very fine musician. That said, a couple of years ago I saw him conduct his Staatskapelle Orchestra to mark the opening of Berlin’s Pierre Boulez Saal. Performed ‘in the round’ I was sitting but a few feet from the players. After the Maestro made his protracted, narcisistic ‘every one look at me’ entrance, there followed a performance of Schubert’s Unfinished Symphony totally devoid of charm and in which the entire orchestra seemed to beplaying in a state of fear and tension and on the edge of their seats (for all the wrong reasons) throughout. At the end, while D.B. took more protracted bows, there was not a glimmer of enthusiasm nor a single smile amongst the orchestra. The previous evening I was sitting in the front row of the Staatsoper, just above the pit, to see Sir Simon Rattle conduct the same orchestra in a searing account of Janacek’s Katya Kabanova. The orchestra applauded Rattle at the start of each Act, then at the close they cheered him as he left. When he came on stage (to a huge ovation from the audience) the whole orchestra turned to face the stage and cheered him long and vociferously with the rest of us. That says it all I think. I can’t talk about his pour treatment of people. I think what is worse is that he is boring. . . boring! One of his mid-90s performances with Chicago along with a Walter Weller performance in Houston are the two most boring performances that I have heard in my lifetime. I think that he has been a much better pianist and I can’t, for the life of me, understand why he is conducting. No amount of genius excuses this horrible behaviour. The classical music world is demanding enough and we don’t need PTSD cases from working under such a primadonna. He’s a scorpio, scorpios are demanding. Live up to the expectations or get out. Mr Barenboim should be more understanding of other people’s mistakes. Last time he played the Hammerklavier in London there were fistfuls of wrong notes. One reviewer likened it to Xenakis. Of course, he’s too important to bother with practising (like mere mortals do). Why is no one speaking about Jaap Van Zweden? He was an absolute terror in Dallas. It seems there is an abundance of nobodies, wannabes, and never-weres in the comment section today. Not so fantastic a pianist.